Despite the turmoil, voters flocked to the polls, standing in long lines in rain and high temperatures to cast ballots. 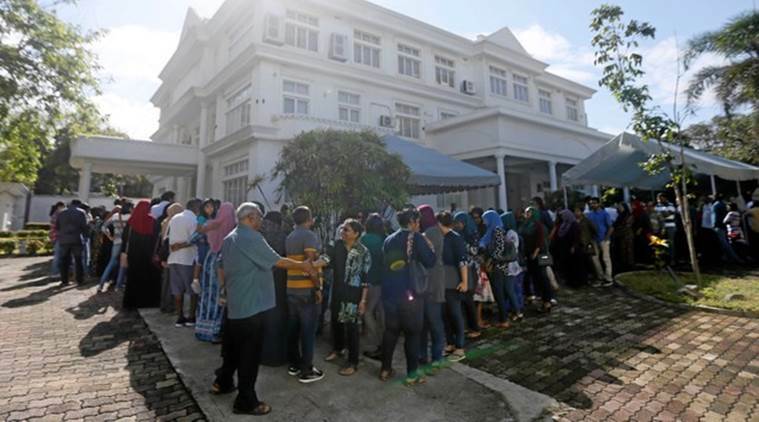 Male: A raid on the opposition’s main campaign office and the spectre of US sanctions on government officials were not deterring thousands of people from heading to the polls Sunday to vote in the Maldives’ presidential election, widely seen as a referendum on the island nation’s young democracy. Famed for its white-sand beaches and luxury resorts, the Maldives under President Yameen Abdul Gayoom, who is seeking re-election, has seen economic growth and longer life expectancy, according to the World Bank. But Yameen’s critics, including the opposition presidential candidate, Ibrahim Mohamed Solih, say he has systematically rolled back democratic freedoms, jailing rivals and controlling courts. What’s at stake in the small South Asian country came into sharp focus on Saturday, when police in Male, the capital, raided Solih’s main campaign office, citing police intelligence that the office was being used to organize vote-buying, according to a copy of a police warrant obtained by The Associated Press. Opposition supporters in the Maldives and in neighbouring Sri Lanka, where former President Mohamed Nasheed is living in exile, decried the raid as a naked attempt to rig the vote in favour of Yameen. The warrant also said that Solih’s senior campaign official Ahmed Shahid was suspected of bribing voters. Repeated calls to Shahid went unanswered, but a Solih campaign spokesman said no one was arrested. After several phone calls and messages, and a visit to Male police headquarters, police spokesman Ahmed Shiffan declined to answer the AP’s questions about the raid. Despite the turmoil, voters flocked to the polls, standing in long lines in rain and high temperatures to cast ballots. The polls were scheduled to close at 4 pm, but opening hours were extended until 7 pm due to high voter turnout, said election commission spokesman Ahmed Akram. Outside a polling station at the Imauddin School in Male, aviation worker Mohamed Ismail, 23, said he cast his ballot for Solih because “people live in fear” under strongman President Yameen, who took office in 2013. 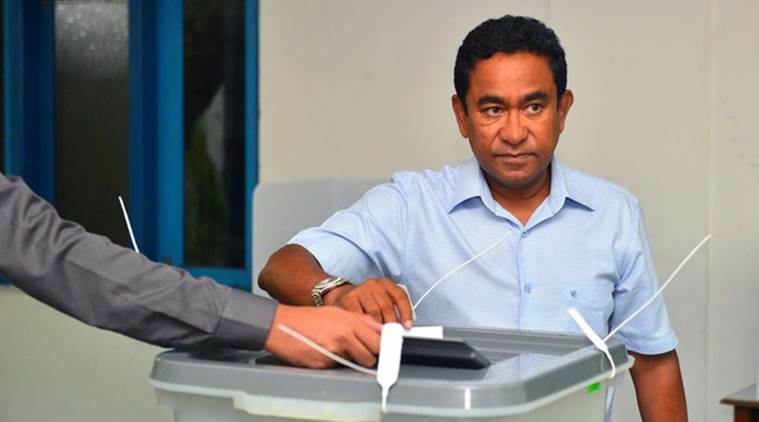 Yameen used his first term in office to consolidate power, jailing opponents, including his half-brother, a former president, and two Supreme Court Justices, and asserting control over the courts. “Look around. People are moving freely,” said Adam Thaufeeg, a 40-year-old government employee, who said he voted for Yameen because of his vision for developing the Maldives. 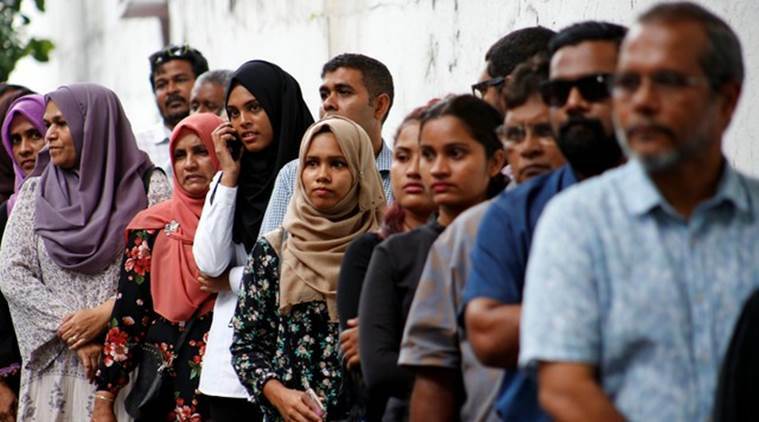 More than 260,000 of the Maldives’ 400,000 people were eligible to vote at about 400 polling stations across the islands that comprise the Indian Ocean archipelago.